The trend in linear motion product selection is often to use profile guides or ball rails. These work on the principle of a block with internal recirculating balls that enable motion along a rail to be achieved. They are available in international standard sizes. 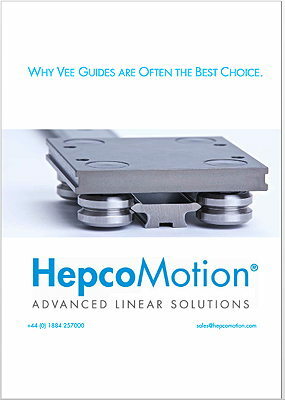 In reality, argues Hepcomotion, designers would be better served in many applications by considering the merits of alternative technologies, with vee-guides – also known as vee-slides – being top of the list. The simplicity, number of design options and ease of installation, along with a long service life, are making vee-guides increasingly popular for many designers. • product design options to reduce assembly times.